Now - that's the zeitgeist. It isn't me. Personally, I normally detest having good whisky with food. I don't want anything to distract from the pure flavors of distilled spirit. I also find that distilled spirits wallop the palate which pretty severely alters the experience of the food. However in a carefully wrought pairing, that's the whole idea. The flavors combine into something new. I'll admit I was skeptical about this chocolate/whisky pairing thing until I had a first hand experience. If you're in New York next week, you can too. A fun whisky and chocolate pairing event will be going down on the evening of March 27, 2012: the Pacari Chocolate & Compass Box Whisky pairing event at the St. Giles Hotel in New York from 5-7pm. Tickets are $35 on line. That's a pretty decent price to taste an extensive flight of nice whisky - and a group of very tasty chocolate bars and enrobed exotic fruits. But this is going to be a bit more than just a flight of whisky and some chocolate - some real thought has gone into the specific pairings in this event. How do I know? In my capacity as a whisky blogger I attended a press preview of this event and I'll give you the full lowdown (thanks, Whisky Woman, for providing the opportunity!). 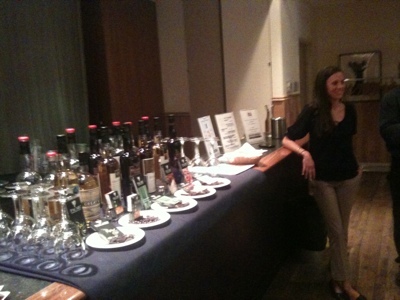 Amanda Diepeveen of ays by the cornucopia of Compass Box whisky and Pacari chocolate. The whiskies here are the Compass Box range. These are John Glaser's iconoclastic collection of delicious concoctions of blended malt and grain whiskies, or just blended malt whiskies, or just grain whiskies. There is some careful barrel selection going on here - but the real magic seems to be in the barrel aging of the blends - in first fill American oak. The floral vanilla oak notes are a thread which binds the line together. Another common attribute is a deft light touch and smooth, short, non-bitter finishes. It's this latter attribute that make Compass Box whiskies so well suited to a chocolate pairing. The chocolates in the pairing are the organic fair trade Ecuadorian Pacari chocolates. This company specializes in raw, ultra dark chocolate that has the clear flavor signature of the nibs. They utilize local and characteristic Andes fruits and spices in their products to bring a sense of terroir. As a man who regularly eats raw cacao nibs, I really appreciate how closely the flavor profile of Pacari hews to the flavors of whole raw cacao. It's masterful stuff. If any chocolate has a chance at standing up to a mouth full of straight whisky it's this stuff. 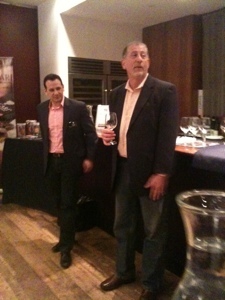 The show was MC'ed by Compass Box's US brand ambassador Robin Robinson and Pacari's Francisco Vivar. They are a couple of jovial and informed showmen. I've caught Robinson's act before. He's particularly engaging and entertaining. If you come to the March 27th event you will be entertained and will probably learn something too. Robin Robinson, Compass Box Ambassador, pours Asyla. 1) Asyla Malt & Grain blend paired with Raw 70% Cacao: Asyla is pale straw colored with a lightly vegetal (sweet parsley?) and honeysuckle floral nose. Entry is sweet and light with gentle demara sweetness while midpalate brings some malt body with a touch of apple and a chalk mineral almost sauvingnon blanc note and a light flush of spirit heat. Finish is short and gentle. Robin Robinson called it "feminine". I'd agree - she's very blonde and supermodel pretty and supermodel thin. The chocolate pairing is the unflavored most raw and elemental 70% cacao raw - which has the big winey heady flavor of raw cacao nibs and is so packed with raw nibs that the texture was a bit gritty. This is beautiful chocolate for people who like raw nibs because it keeps that flavor and elevates it. The pairing however was the weakest - only adding spirit heat and a bit of malt glow to the more powerful cocoa flavors. 2) Great King Street Blended Scotch paired with Pacari chocolate covered golden berries: Great King Street is a rich golden yellow. The nose is nice and rich with sweet and salted butter, butterscotch, and sultanas (rich golden raisins). Entry is sweet with toffee, midpalate broadens with slight sherry notes, some bakery notes (apple crisp) mild spirit heat and some oaky vanilla perfume. Finish is gentle and short. No grain burn or any trace of coffey still fishy oniony flavor signature detected. Very nice. (Great King Street is a potential Johnny Walker Black Label killer and I'll be doing a full review including a head to head of that duo in the very near future.) The pairing worked with golden berries that have a sultana-like flavor and an addictive crisp texture arising out of crystal sugars and the fibrous berry's dried body - nicely draped with a crisp thin shell of intensely flavored inky dark Pacari chocolate. The pairing put the vibrance of the berries in harmony with the soft fruits of the whisky. Great King has more malt body - so it holds up to the robust chocolate better - plus the berries have less chocolate so the flavors were more equally matched and neither overwhelmed the other. 3) Hedonism grain Scotch whisky paired with Pacari Lemongrass chocolate bar. Hedonism is pale gold. Light sherry with spiced notes of clove and allspice on the nose. Entry is bright and sassy with sweet white grape. Expansion is quick and light with coconut, cake batter and toffee. Body is very light. Finish has kiss of oak and vanilla floral note. The pairing here is inspired. The Lemongrass in the chocolate is citrusy and highly aromatic. The bright opening of Hedonism picks it up and their symphony is intensely vegetal, rich, tasty and unexpected. The best matchup of the day - but other good ones follow. 4) Peat Monster paired with Pacari Pink Salt & nibs bar. Peat Monster was even better than I remembered: pale gold in color with a rich nose that hits iodine first, then earthy peat and maritime brine with warm sweetness underneath. Entry is bright and toffee sweet like Caol Ila 12. Then smoke and a rich coffee (with cream and sugar) note followed by a salty ocean breeze. Some nice oak and vanilla on the short gentle finish. The pairing here was a scrumptious dark chocolate loaded with crunchy salt flakes and cacao nibs. The rich smoke, earth, iodine salt whisky meshed beautifully with the big smoky peat. The brine air in the Peat Monster meshed with the mineral loaded pink salt flakes and rich dark cocoa to form a smoky salty rich chocolate caramel confection that hit my monkey bone - hard. 5) The finale was Orangerie Scotch Whisky (a whisky infused with orange zest, cassia, and clove) paired with Pacari Chilli-Spice bar. Compass Box's Orangerie reminds me of a drier Cointreau (actually very high praise in my book - Cointreau is one of the finest liqueurs). Pale gold in the glass with a nose full of rich blood orange, Orangerie keeps the spice hidden like a fan dancer. The heat of the cassia (cinnamon bark) emerges with the fade of the finish as a cryptic glow. The pairing here is darkest chocolate studded with chile pepper and coriander seeds. You can see where this pairing is going, rich bitter orange bitter chocolate sherbert with a wicked kick of heat at the finish in both capsicum and cinnamon dimensions. Another monster pairing. Bottom line here - 4 out of 5 of these pairings were total winners in my book. Personally I wasn't expecting to enjoy the combination of any whisky with any food - but I had my horizons expanded - big time. The event didn't quite end there. The full line of Compass Box whiskies were up at the bar and I enjoyed tasting Oak Cross Malt and The Spice Tree malt. These were my hands down favorites (except maybe the Peat Monster). I obtained samples so these will be the subjects of full reviews in the coming days. I feel privileged to have had a preview of this tasting. It was a great introduction to the concept and practice of whiskey-chocolate pairing. If you can make it come to the main event on March 27th. I'll be there. I read Scotch Drammer's article about chocolate pairing, and it sounds like it's not as simple as "get some whisky and get some chocolate." Something I'll probably avoid, even though I'm sure some combos work, just because I wouldn't want to ruin a dram. Compass Box is a very interesting outfit. There is a clear "editorial voice" in the mixing - but a wide and eclectic range of blends. The flavor profile is definitely slanted towards gentle, light, and floral - with Asyla, Great King St., and Oak Cross in that neck of the woods. Hedonism is there too - but has a bright almost citrus acid note in the opening that makes it quite distinct. It's made from grain whisky entirely - no malt; so it's really a very different thing completely. On the rich flavor end of the spectrum they have Peat Monster, which is a very pleasing, gentle yet rich Islay flavor profile. They say there is a peated Speyside malt in there which makes it more gentle and less maritime than pure Islays. The Spice tree is a something utterly unique in my experience. The emphasis is on the wood - but the wood is an unusual French oak called "Quercus petraea" which has a very clear and distinct flavor profile which is oaky, spicy (with a spice flavor complex that puts me in the mind of baking spices like allspice, star anise, cloves...), an herbal component. I must review it with a fresh palate. The reason Spice Tree was my favorite was that it was richly flavored, totally unique, and strongly wooded. That's the holy trinity for me. It also has the longest finish of any Compass Box whisky (other than the lingering peat in Peat Monster or the orange cinnamon wallop of Orangerie). Oak Cross is lighter and brighter than Spice Tree with a wild fruity and vivid flavor profile. My tasting notes include references to "juicy fruit, jujubees, slivovitz (the Eastern European plum brandy akin to plum grappa that my Grandfather distilled in his basement), honeyed, floral vanilla, big opening, relatively short finish". Wild and different. It's not as dark, or intense or has as long a finish as Spice Tree, but Oak Cross is fresh ground too - a very interesting and distinct flavor profile that, unlike Orangerie, isn't "flavored" and still reads 100% as Scotch whisky. As far as chocolate pairing - it's a black art to me. I have no clue. I'm still at the barest beginning phases of understanding how to pair WATER with whisky. Look for water integration experiment #3 - marrying in the bottle for a week right not. I've reduced the dilution of Bookers and am giving it much more time. I'm determined to find the sweet spot... However, the amazing success of the pairings here have opened my eyes to the possibilities of whisky pairings and I'll be thinking on this topic going forward. Bourbon definitely goes with food. Try bourbon with some cinnamon babka sometime. I might get myself in trouble with this next comment, but I've been thinking about what I really want to be drinking and why, and I'm thinking that bourbon is more just a tasty, delicious "drink." I want a bourbon just when I want to chill out with something good and stiff. I don't really care about flavor complexity as much, and so I don't mind messing with it and food. Scotch, on the other hand, is where the excitement is at for me. The flavors there can be the experience in themselves, which is why I'd be more hesitant to break it up with food. This may not be fair though, because I've been drinking some good scotch but mostly average bourbon. Cheap scotch - as I'm sure you know - certainly is nothing to write home about. I'll try the cinnamon babka pairing - that sounds awesome. I'll try the bbq thing and get back. As for your controversial comment that Scotch is more serious and tougher to pair than Bourbon which is just looser and easier; I'm on the record on the other Ryan's blog that I think Scotch has much more variation, more terroir, and ultimately greater range and interest than Bourbon. However, within its more narrow range, there are some amazing sipping Bourbons that demand reflection, time, and reward concentration. A quick listing of those includes Wild Turkey Kentucky spirit, Elijah Craig 18, Parker Heritage, Pappy Van Winkle 15, Four Roses single barrel, Four Roses Marriage edition, and Four Roses Annual edition. Heck, I'd even say that Knob Creek is a thoughtful sipping whiskey - and not just a quaff. I love cheap Bourbon for just chilling. Evan Williams in coke, for example, or just in shooters - knock 'em back. Buffalo Trace, Jim Beam Black, Elmer T., OGG, there are many that just drink and not think - but they don't rule the roost in Bourbon-land. I'm a true blue Yankee from a yuppie enclave of the NorthEast - but I'm a true son of the south when it comes to pride in the National American Whiskey. Bourbon is as American as Mom, apple pie, and New Orleans jazz. Just as sure as the stars and stripes can bring a tear to my eye I'm sure that the finer examples of Kentucky Straight Bourbon Whiskey can stand with any Scotch or Cognac toe to toe and beat them for subtlety, grace, complication, and sheer elegant drinkability. Start with either Wild Turkey Kentucky Spirit or Elijah Craig 18. Both are around $45-$50 and both approach the absolute heights in my opinion. That's no carpetbagging; that's Chuck Norris level American value. Yeah, I think I haven't given bourbon a fair shake at the high-end. I have only really had the mid-range bourbons. I do have a couple of high-end bourbons in the cabinet, so we'll see what tune I'm singing at the end of the year after I get to them. Still, even though I have those in the cabinet, I'm not dying to get to them like I am my good Scotches. Maybe I'll find a spot in my open-bottles for one of those nice bourbons soon... I'm sticking to my one bottle a month plan in the long run, so I just need to weigh opening the bottle with increased shelf life. That Compass Box tasting sounds like good fun! Glad to hear that Whisky Woman was able to hook you up. You New Yorkers get to have all the fun when it comes to Whisk(e)y! Thankfully, Philly gets oodles of Craft Beer respect, so at least we have that. On a positive whisk(e)y note, thanks to guys like Jose Garces, Bourbon has been coming on strong down here, so Single Malts can't be far behind! I just wish they weren't so expensive at the bar. Love the Bourbon vs. Single Malt discussion! Though I typically prefer Scotch whisky to Bourbon, I would never go so far as saying that one is better than the other. My ultimate goal is to be at the point where I can decide exactly what I want to drink given my mood at a particular moment. I just wish I had the tasting memory that some of you guys have. I know what I like but have a tough time remembering all the nuances. There is an upside to this of course... I have to pour myself a dram to refresh my memory. That should keep me from getting bored any time soon. Heh. There has been a lot of "which genre is better" talk lately. Sku just did the "what if you had to choose only Irish or Canadian" (the skinny beat up kids of the whisk(e)y world). Other Ryan just did the "which whisky is best" thing. It's fun to talk about these variations. I think Scotch has the most variety, but that doesn't mean the Bourbon world doesn't scale the highest heights - just the range of different expressions hews more closely to a particular flavor profile. To a large extent this is determined by the law. Or course, in reality, no one has to choose among the world's whiskies. Each region is changing and producing better products as craft distillers get involved and the better distilleries produce higher end special selections. There are awesome selections from every region. I enjoy variety so I'm all over interesting new offerings from every corner of the globe. I've got new unopened bottles from places like India and Texas in my cabinet. I'm happy as a clam about it. I think we share the same philosophy. I'm all about variety. Sure, I have preferences, but that doesn't mean I don't like to mix it up and try new things. I adore what I've tasted from Japan (Yamazaki, Nikka, and Hibiki). I really enjoy what Sweden is doing (Mackmyra). And the Irish, Scots, and Americans still dominate the industry. It's a great time to be a whisk(e)y lover! Yes, Japan is rocking the house. 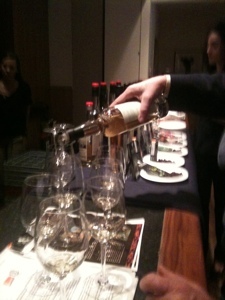 It's funny you mention Mackmyra, I had an opportunity to try it at a Park Ave. Liquors event. It was very nice - dry, lean, and elegant with a lovely grain structure. Ultimately a bit dry for my tastes - but shockingly decent. It's a great time for whisky. Such a great post! I'm really happy you were able to go. Sounds like an amazing event. Thanks for the props - though it really just makes me happy to be able to share! And G-LO, don't worry, if you and the BoozeDancing crew were here - I would have certainly connected you with the host(s) as well! Whisky Woman! Now it's a party. Boy - sipping Scotch in the Sun at Balvenie. You have somehow figured out exactly how to live. Please explain the magic to me sometime. Have a great voyage and please blog all about it so I can live vicariously. Thanks for the kudos on the post. Please keep me in mind for other events. I'd be extremely happy to ride your slipstream. I have no doubt that you would have hooked us up as well. You're a generous soul and we appreciate it immensely! Personally, I prefer whisky with food, you just have to find the right combinations; this is not done by trial and error, but by sampling the whisky neat and thinking (a lot) about what flavours would complement it. Chocolate is usually a good match (the salted chocolate with Peat Monster sounds divine), but I've had very good luck with others, such as Glenmorangie 10yr and baklava, Peat Monster and smoked salmon, Auchentoshan Three Wood and Christmas Toffee Cake, etc. Dragons & Dragonflies looks awesome. I'll be reading it over the next few days. I'm all over Saint Clynelish’s Day (and the Clynelish in particular sounds like an awesome dram).